Caterpillar Inc. is an American company based in Peoria, Illinois and the world's largest manufacturer of mining and construction equipment. The company was founded in 1925 by merging of the Holt Manufacturing Company and the C. L. Best Tractor Company and deals with construction of heavy machinery, mainly the production of earth-moving machines like bulldozers, loaders, hydraulic excavators and machines for the mining industry, forestry and road-building machinery and diesel-electric locomotives. Important is also the production of Caterpillar diesel engines as well as natural gas engines and gas turbines for various applications. Caterpillar also owns its clothing brand and offers workwear boots. Caterpillar has offices and factories in more than 180 countries and about 98,000 employees around the world. Caterpillar machines are significantly characterized by a distinct yellow color, used since 1931. Excavators are used for digging holes, landscaping, lifting and placing large objects, and demolition. Other tasks can be also completed by using hydraulic attachments such as grapples, shears, multiprocessors or hammers. The first CAT hydraulic crawler excavator was made in 1972 — the 225, which weighed 25 tonnes and had a performance of 100 kW. In 2018, Caterpillar started to produce new three next-generation excavators in 20-ton class - the 320 GC, the 320 and the 323 with increased operating efficiency, lower fuel consumption and lower maintenance costs. In 36-ton size class, Caterpillar produced the 336 and 336 GC crawler excavators. These new Cat excavators are capable of bigger productivity at lower costs and offer reduced maintenance costs and fuel consumption by up to 15 percent over the previous series. They are also equipped with the Cat LINK™ hardware and software, which connect job site with the office and send important information to customers. Customers can choose between Comfort, Deluxe, or Premium cab packages. Cat also offers demolition excavators - the 336FL, the 340F UHD, and the long reach excavators: 340F LRE and the 352F LRE. Caterpillar excavators are standardly equipped with warning systems such as critical engine oil pressure, coolant temperature and oil temperature. The hydraulic tank, control valves, and main pumps are located close together to allow shorter lines between components, reducing friction loss and pressure drops. 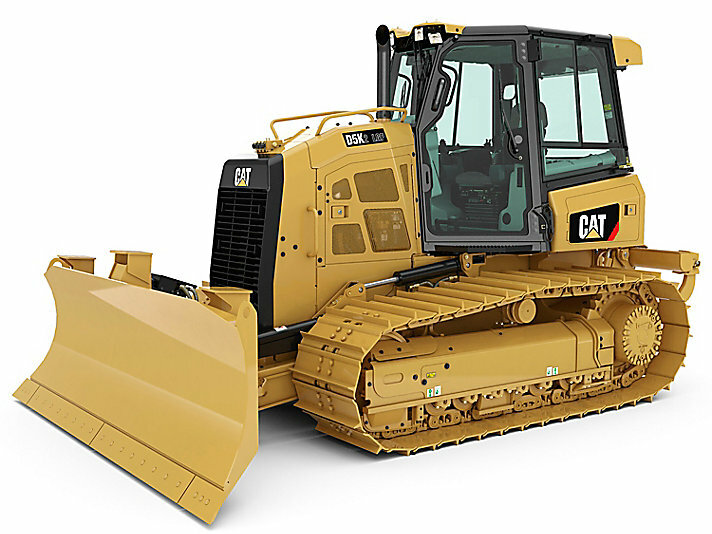 Machines such as Caterpillar 340F L or Caterpillar 325F are furnished with Caterpillar’s so-called VisionLink® and Product Link™ technologies which connect clients with their job site and providing business information, which increases production and minimizes operating costs. The owners can see where their machines are and what are they doing at that moment, how much fuel they consume and how much power is used. This helps to prolong the service life of machines. Caterpillar crawler excavators can be further divided into small excavators (CAT 313F), medium excavators (CAT 323), large excavators (CAT 390F L) and demolition excavators CAT 340F UHD) categories. Caterpillar 's wheel loaders are very versatile. Although they are mainly used for loading and unloading various material and digging, they can operate in agriculture, forestry and the mining industry. Even combat engineering uses armored Caterpillar wheel loaders for missions in militarily occupied territories. Caterpillar introduced its first wheel loader in 1959 — the 944A. At that time, the wheel loaders were called the “Traxcavators.” Caterpillar 944A was different, because it had wheels instead of trucks and was equipped with twin lift arms instead of a vertical mast. It was given a four-cylinder Cat® D330 Diesel Engine. The name was formally changed from “Traxcavators” to “Wheel Loaders” in 1965. In 1963, Cat launched the 988 and the 966B articulated steering wheel loaders. These were followed by Caterpillar 922B wheel loader (1962), Caterpillar 950 (1964), Caterpillar 980 (1966), Caterpillar 930 and Caterpillar 992 (both in 1968), and Caterpillar 920 (1969). In 2012, Cat followed with the H-series of wheel loaders with 986H and 988H models with the Cat C15 ACERT™ engine capable of net power of 300-310 kW, which is still available. In 2013, the K-series was added to the range, which contains Caterpillar 986K, Caterpillar 994K and 4 more models. Nowadays, Caterpillar offers its last M-series of wheel loaders, which was introduced in 2014. It includes CAT 906M wheel loader, CAT 982M and 13 more models. Caterpillar also added the XE Advanced powertrain, first introduced with the 966K XE, continuing with CAT 966M XE, CAT 988K XE, and the new Caterpillar 972M XE joining the product line. Within the XE technology is 25 percent lower fuel consumption, than in machines with traditional torque converters. Caterpillar’s offer of wheel loaders ranges from compact wheel loaders with net power of 55 kW to large wheel loaders with net power of 726 kW and rated payload of 27 tons. CAT offers wheel loaders in various sizes and loading capacities from 0,9 m³ to 44 m³. The largest wheel loader, Caterpillar 994K, was introduced in 1990 for the first time and delivered a performance of 1297 kW conforming with the new Tier 4 Final/EU Stage V emission level. Over the years Caterpillar wheel loaders underwent many safety improvements like LED warning system, higher cab position for better visibility, six mirror system, and Cat Detect, which includes Cat Vision, thus enhances operator awareness around the machine. Caterpillar mini excavators are popular because of their ability to work and maneuver in small spaces. The combination of compact size and powerful engines makes them suitable for restricted areas. Caterpillar 300.9D is the lightest Caterpillar mini excavator, weighing 985 kg. Its bucket digging force is 8,9 kN. Caterpillar 300.9D mini excavator is powered by Yanmar 31NV70 engine with gross power of 13,7 kW (18 hp). It is not equipped with a cabin, but just with a removable safety frame, making it even more compact mini excavator. Caterpillar 302.2D mini excavator, weighing over 2 tons, is designed for hard work — it has a rugged construction and protected hydraulics. Caterpillar 302.2D also offers comfortable and ergonomic cabin with enhanced visibility. The 302.2D’s engine is Yanmar 3TNV76 rated at 17,9 kW (24,3 hp) gross power, that allows the machine to travel at maximum speed of 5,6 km/h. Caterpillar 302.7D CR mini excavator is a zero tail swing machine, allowing the operator to work without having to worry about the back of the machine. Caterpillar 302.7D CR weighs 2,6 tons and can be also equipped with optional counterweight increasing the machine’s lifting capacity. The versatility of Caterpillar 302.7D CR mini excavator can be enlarged with range of optional tools such as hydraulic hammers, buckets or grapplers. Caterpillar 305.5E CR features increased stability, which leads to increased productivity and versatility, when using heavier work tools. Caterpillar 305.5E CR is equipped with Cat C2.4 engine rated at 34,1 kW (45,7 hp) gross power. The engine has automatic two speed feature providing optimal performance. Caterpillar 305.5E CR weighs 5270 kg. Caterpillar 307E2 mini excavator is a versatile model, capable of equipping various attachments such as heavy duty buckets, hydraulic hammers, augers, vibratory compactors, ripper and couplers, to maximize the productivity and performance. CAT 307E2 is equipped with Cat C2.4 Turbo electronic engine of 39,6 kW (50,6 hp) gross power, meeting Tier 4 Final/Stage IIIB emission standards. The machine weighs 7270 kg and offers digging force of 50,6 kN. The largest Caterpillar mini hydraulic excavator is the 308E2 CR — 8,4 tons heavy machine with maximum dig depth of 4150 mm, Cat C3.3B engine of 49,7 kW (66,6 hp) meeting Tier 4 Final/Stage IIIB emission standards. CAT 308E2 CR mini excavator also features Product Link™ technology and Cat Product Link system helping to keep track of the machines. This satellite technology reports valuable information about the location, machine hours, maintenance and security alarms, further enhancing machine efficiency. A skid-steer loader is a small, rigid-frame machine with lift arms used to attach a wide variety of tools or attachments like buckets, hammers, grapples, trenchers, shears, etc. First Caterpillar skid steer loader was the 216, launched in 1999. CAT skid steer loaders were basically invented as a mixture of mini-hydraulic excavators and compact wheel loaders. The first product line therefore began with Caterpillar 216, immediately followed by CAT 226 and finally growing to eight models ranging from 35 kW to 79 kW (47 hp to 106 hp). CAT 216 provided a bucket capacity of 0,36 m³, just like Caterpillar 226. Other early Caterpillar skid steer loaders were for example CAT 246 (weight of 3,21 tons, bucket capacity of 0,4 m³, lifting force of 21,8 kN, CAT 3034 T engine rated at 55 kW/74 hp), CAT 247 (weight of 3 tons, bucket capacity of 0,4 m³, lifting force of 13,66 kN, CAT 3034 engine rated at 41 kW/55 hp), CAT 232 (weight of 3 tons, bucket capacity of 0,36 m³, lifting force of 17 kN, CAT 3024 C engine rated at 36 kW/48 hp) and CAT 242 (weight of 3,03 tons, bucket capacity of 0,4 m³, lifting force of 17 kN, CAT 3034 C engine rated at 41 kW/55 hp). Currently offered Caterpillar skid steer loaders have rated operating capacity from 635 kg to 1656 kg. These features make skid-steer loader, such as Caterpillar 216B Series 3, the most versatile machine on jobsite. The Caterpillar machines, like the 242D, include a quick coupler system, which ensure that work tools can be changed quickly and easily. The CAT Electronic Torque Management System provides maximum performance and production capability with optional two speed travel. Machines such as Caterpillar 262D skid steer loader contain high-efficiency hydraulic oil cooler, which lets the machine work longer and harder in higher temperatures, even with continuous performance. Wheel excavator is a piece of versatile construction machinery. Caterpillar claims its machines offer mobility, reliability, high speed and power. In 1991, Caterpillar launched first series of its models with the “B” suffix such as Cat 212B (bucket capacity of 0,7 m³, 83 kW of power) and Cat 224B (bucket capacity of 1,2 m³, 100 kW of power). After that, Caterpillar launched the C-series (such as CAT M313C Mono, CAT M316C Mono), the D-series of wheel excavators (such as CAT M315D Mono, CAT M318D Mono), some material handler models (prefix “MH”, such as CAT MH3024 - maximum horizontal reach of 10,4 m and 129,4 kW of power) and the D2-series (such as CAT M322D2), until finally in 2017, Caterpillar released the F-series of wheel excavators (such as CAT M314F - bucket capacity of 0,53 m³, 105 kW of power, CAT M322F - bucket capacity of 1,19 m³, 126 kW of power). Caterpillar backhoe loaders basically combine two machine-types. They are equipped with a loader-style bucket on the front and a backhoe at the rear. 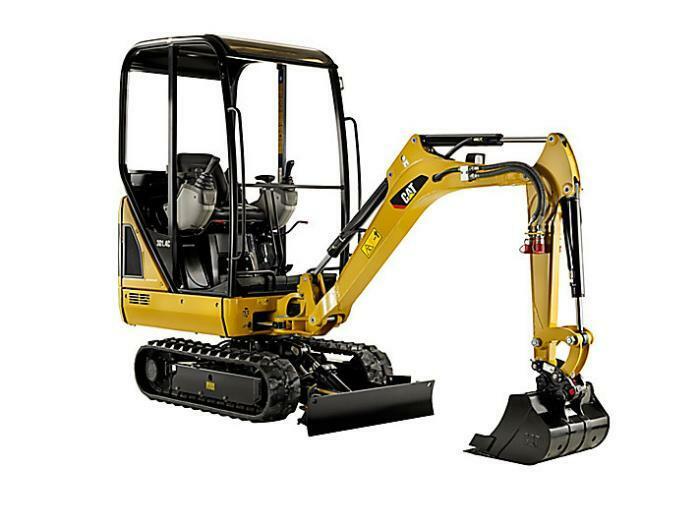 Backhoe loaders such as the CAT 415F2 IL can be used in urban engineering and small construction projects (building small houses, fixing urban roads, etc). Caterpillar produces backhoe loaders with Center-pivot or side shift frames and the buyers can choose between 2- or 4-wheel drive. Caterpillar started to produce backhoe loaders at 1985 by releasing the A-series. The first model was called the Caterpillar 416A and it was launched with a lift capacity of 2 tonnes and an operating weight of 6 tons. In 1989, CAT launched the B-series, which had a modified swing system for increased torque and speed (e.g. CAT 438 B 4x4). Later in 1996, the Caterpillar C-series for backhoe loaders with upgraded CAT 3054 4-cylinder diesel engine with a performance of 59 kW, followed. One example would be the CAT 438 C 4x4. The Caterpillar 416D came out in 2001 with the cleanest inhouse-built combustion engine Cat 3054 (e.g. featuring the CAT 442 D 4x4). In 2005, the E-series was introduced with a new Cat 3054C 4-cylinder diesel engine equipped with direct injection (coming into effect in e.g. the CAT 428E 4x4 backhoe loader). The machine’s boom was redesigned with improved digging force including increased hydraulic breakout force. In 2012, Caterpillar started to produce the succeeding F-series models such as the CAT 430F and CAT 420F. The F-series loaders were given the new Caterpillar C4.4 Acert DIT 4 cylinder engine - rated at 72 kW. This series also got a completely redesigned exhaust system, with the exhaust stack being run up the side of the cab which resulted in an increase of the operator’s visibility. The newest Caterpillar F2 series has been available since 2015, including the CAT 416F2 center pivot model. A bulldozer is used to push large quantities of soil, sand, rubble, or other material during construction work. There is also a ripper placed behind the machine, which is determined to loose stuck materials. CAT dozers, such as the D6K2, have fully automatic four-speed lock-up clutch with added gear between the first and the second lock-up clutch for smooth shifting. Models like Caterpillar D10T2 are equipped with CAT Connect technologies as Product Link™, VisionLink® remote monitoring and Liquid Crystal Display securing operator’s comfort and providing better overall machine performance. The main case, front cross member and equalizer bar saddle are made from heavy-duty steel, which is very durable. Caterpillar bulldozers can be furnished with different kinds of blades: the High-Capacity Universal Blade is determined for pushing loads over a long distance, the Semi-Universal Blade is used when penetration is required. Cutting Edges made of DH-2™ steel and End Bits made of DH-3™ steel are optimal for tough materials. Caterpillar actually offers various sizes of dozers: small dozers (CAT D3K2, CAT D4K2, CAT D5K2), medium dozers (CAT D6K2, CAT D6N, CAT D6T, CAT D7E), large dozers (CAT D9T, CAT D10T2, CAT D11T/D11T CD) and waste handling machines (CAT D6N WH, CAT D6T WH, CAT D9T WH and 3 more). Moreover, these CAT dozers are available in two variations based on the undercarriage type — XL (extra long) and LPG (low ground pressure). Caterpillar’s articulated dump trucks are mainly designed for transporting loads over rough terrain. Dump trucks usually use the all-wheel drive and consist of two basic units. The front tractor and the rear hauler which is connected by the joint which helps the machines adapt to uneven terrains. The Caterpillar dump trucks usually have six-speed gearboxes and go up to 55 km/h top speed in a straight line. The biggest Caterpillar articulated dump truck CAT 745 has a rated payload of 41 tons and heaped body capacity of 25 m³. The Caterpillar 745 also offers the highest power rate of 381 kW (511 HP). If you need a “smaller” machine, the 725 could be the right choice. The Caterpillar 725 offers 13,7 m³ of heaped capacity, a payload of 22,7 tons and a Caterpillar 3176 C-ATAAC- EUI engine with 209 kW (280 HP). 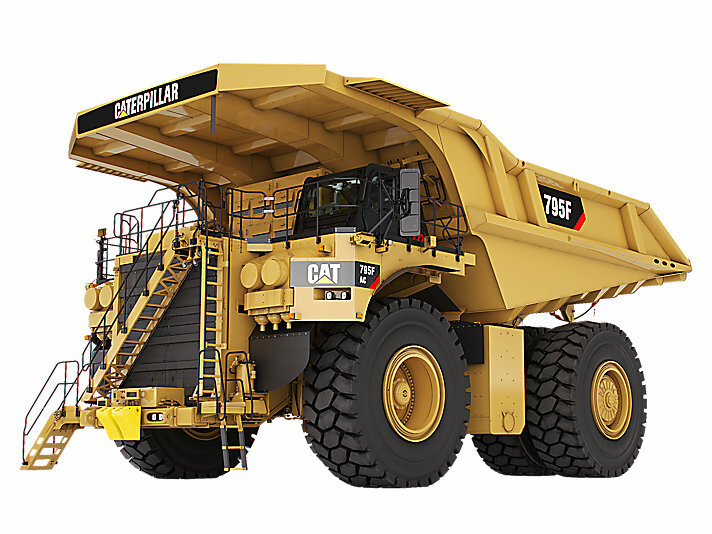 The Caterpillar 725 dump truck weighs 21,7 tons, whereas the 745 is a 33,4 tons heavy machine. Operators control the truck via the VisionLink™ technology which allows for daily tracking of productivity from the cabin with quick access to truck payload weights. Articulated dump trucks, such as the 23-ton heavy Caterpillar 725C2, are equipped with Cat Detect including Stability Assist which automatically notifies the operator whenever the dump truck breaches the threshold to unsafe angles and stops the operation consequently. Newest machines launched in 2017 are the Caterpillar 730 and the 735 dump truck. As usual, higher model numbers indicate a larger machine with stronger engine and better performance — the CAT 735 offers 20 m³ of dump capacity, 32 tons of payload and Caterpillar C13 Acert engine rated at 316 kW (424 HP) with Tier 4 Final/Stage IV emission regulation as well as a 7.47 m turning radius, whilst the CAT 730 is equipped with Caterpillar C13 Acert engine rated at 274 kW (367 HP) with Tier 4 Final/Stage IV emission regulation, dump capacity of 17.5 m³, a net load of 28 tons and a turning radius of 7,47 m. In July 2018, Caterpillar celebrated reaching the milestone of 50,000 sold and delivered articulated dump trucks, since 1985. Off-highway dump trucks are specifically designed for use in mining and heavy-duty construction sites. They can travel up to 80 km/h speed forward and 17 km/h in reverse. 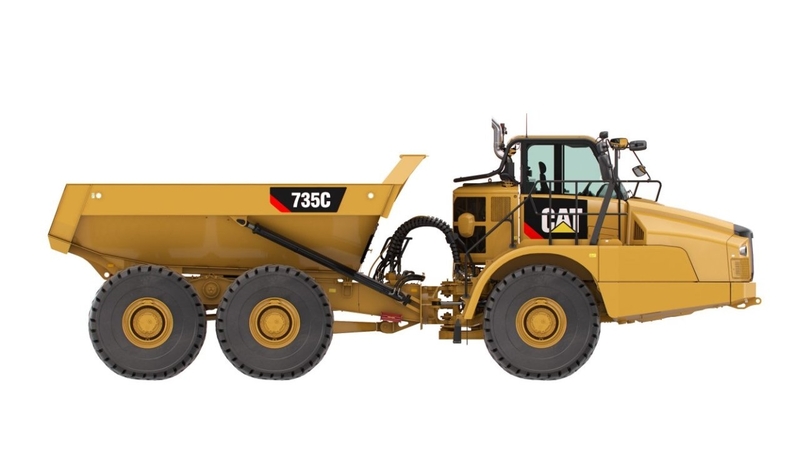 The biggest Caterpillar dump truck is the 797F with Cat® C175-20 engine rated at 2983 kW (4000 hp) of gross power. Its payload is 363 tons (heaped). Off-highway dump trucks are equipped with VIMS™ 3G monitoring system, which provides the operator with data about payload and critical health status. Safety is very important for Caterpillar, and that is why CAT uses 10/10/20 Overload Policy, that assures smooth machine running even at 20% overload. These giant trucks are equipped with four wheel, forced oil-cooled, multiple disc brakes. An oil film between the brakes assures a longer life. Steel structures are made of mild steel, which provides flexibility and resistance to impact loads. CAT developed off-highway trucks specifically for mining, quarry and construction applications. The first Caterpillar off-highway truck was showed to the public in 1963 and it was called the 769, which weighed 35 tons. This truck could bear 23.3-cubic-yard capacity rear dump and it could travel about 67 km/h. In 1974, Cat introduced the 777 model with power of 650 kW, then in 1996 it was upgraded with the power of 699 kW and it was called CAT 777D. The D-series includes CAT 785D, CAT 789D and CAT 793D which are still available. Then came the E-series, which brought CAT 773E and CAT 777E models. Caterpillar started the production of F-series in 2009, which replaced the B-series (manufactured since 2002). For example, compared to Caterpillar 797B, the 797F has a higher payload capacity and a more powerful engine. Caterpillar 797F has a payload capacity of 363 tonnes but CAT 797B could carry 345 tonnes. The engine power increased from 2513 kW to 2828 kW. Caterpillar also offers the 793F with power 1975 kW in the F-series. In 2012 at Bauma China, CAT was showcasing 772G off-highway truck with a payload capacity of 47,2 tonnes. Caterpillar 772G off-highway truck is driven by Cat C18 ACERT™ inline 6-cylinder diesel engine. Many of the great features are introduced on larger Cat G Series truck model 770G, which uses CAT C15 engine with net power of 356 kW and the 772G model equipped with the C18 engine with net power of 410 kW. The G-series also contains CAT 770G, CAT 773G, CAT 775G, and CAT 777G models. In 2015, Caterpillar began to produce the 794 AC model, which delivered a 291 tonnes capacity. This truck uses the Cat C175-16 engine with Cat AC powertrain. The Cat AC drive system gives better retarding, braking and machine control. The milling machines category includes two separate, but similar Caterpillar categories of construction machinery: road reclaimers such as Caterpillar RM500B and cold planers such as Caterpillar PM620. Road reclaimers are used to pulverize the asphalt and mix it with additional base (optionally adding asphalt emulsion) to stabilize and improve worsened and damaged roadways. One of the first Caterpillar road reclaimers is the SM 350, manufactured in 1997-1999. Caterpillar SM 350 road reclaimer weighs 19,5 tons, its cutting width is 2438 mm, cutting depth 470 mm and it is equipped with Caterpillar 3406 B engine with power of 316 kW/424 hp. In 2000, Caterpillar replaced the SM-series with RM-series of road reclaimers (e.g. RM 350 B). Caterpillar cold planers such as the PM620 or the PM820 are used for removing parts of the surface (even the whole surface). The milled road surface can be later recycled and used as a construction aggregate in new pavement. A tracked or crawler loader is a versatile machine used to load, carry, dig and push material around the worksite. Crawler loaders combine the stability of crawler excavators (tractors) with the abilities of wheel loaders. The history of Caterpillar’s crawler loaders dates back to 1953, when CAT introduced and released its first original hydraulic crawler loader, the No. 6 Traxcavator. In 1994, Caterpillar introduced the 933, the 973 and the 939 crawler loaders, which weigh 8,7 tons, 21 tons and 10,03 tons, respectively, and are equipped with buckets of 1 m³, 2,8 m³ and 1,2 m³. CAT 933 is powered by Cat 3046 DI diesel engine rated at 52 kW (69,7 hp), whereas the driving unit of CAT 939 is Cat 3046 T diesel engine offering 68 kW (91,2 hp) and Cat 973 crawler loader is equipped with Cat 3306 DITA engine rated at 157 kW (210,5 hp). During the upcoming years, Caterpillar launched consecutively the B, C, D and K series of crawler loaders. A paver is used to lay asphalt layers on roads, which are later compacted by a roller. The hopper’s of asphalt pavers are often fed by large dump trucks. Caterpillar rubber tire pavers are more suitable for applications that require mobility and frequent relocating compared to their tracked counterparts. Since 1985, when Caterpillar entered the asphalt paver market, CAT produced efficient wheeled pavers such the AP 600. This model was introduced in 2006, it weighs 14,15 tons and its standard dimensions are 6,4 m x 2,5 m x 3,8 m (l x w x h). Caterpillar AP 600 wheeled paver can be hydraulically extended to 7,5 m of length and its maximum paving width is 4,7 m. CAT AP 600 is powered by Cat 3056 E-ATAAC engine rated at 129 kW (173 hp). Caterpillar AP600D offers better maneuverability supported by three steering modes including Travel, Maneuver and Pave. The Maneuver mode is unique, providing 1,4 m turning radius. The drive power of Caterpillar AP600D wheeled paver is provided by CAT C6.6 engine rated at 129.5 kW (176 hp), that meets EU Stage IIIA requirements. Quite interesting is also the usage of double operator’s station offering enhanced visibility. The operating weight of CAT AP600D wheeled paver is 18,2 tons and the hopper capacity is 6,5 m³. Caterpillar AP1000E wheeled paver offers turning radius of 0,5 m, maximum travel speed of 20 km/h, rigid electric screeds providing better stability, adjustable push roller, sensor mix delivery system and reversible augers and conveyors. The operating weight of Caterpillar AP1000E with AS3301C vibratory screed and C7.1 engine (Tier 4 Interim/Stage IIIB, rated at 168 kW/225 hp) is 18,43 tons. The maximum paving width of Cat AP1000E is 7,38 m. In 2017, Caterpillar introduced the F-series of wheeled and tracked pavers, featuring 10 models. Caterpillar wheel dozers, such as the 824K, offer approximately three times faster travel speed than their track type counterparts and they also provide maneuverability due to 4-wheel-drive and articulated steering. Standard Caterpillar wheel dozer, like the 844K or 814K, is equipped with a blade on the front of the tractor and a ripper at the rear. The blade is used to push rocks, debris, sand, snow and other construction material. Caterpillar 834K and other mobile dozers are therefore versatile as they are suitable for many applications such as material cleanup, stockpile, road maintenance, reclamation or surface mining. In 2007, Caterpillar introduced the 814F Series 2 wheel bulldozer, weighing 21,7 tons and offering travel speed of 31 km/h, while being equipped with Caterpillar C9 Acert engine with power of 189 kW/253 HP. Caterpillar produces their engines all around the world for agriculture, construction, mining, drilling, aerial lifts, forestry sectors, ships and data centers for more than 85 years. Caterpillar also manufactures diesel (such as CAT C1.1 50 HZ) and gas generators (Caterpillar DG50-2 Single Phase) and oil and gas engines (Caterpillar G3304B), suitable for different situations in heavy machinery industry. CAT engines range from 5 kW to 16 000 kW of power, which makes them capable of handling any kind of work. Caterpillar also developed ACERT™ technology. This system allows multiple injections in each combustion cycle. Small amounts of fuel are injected at regular intervals to achieve the combined goals of fuel economy and lower emissions. Caterpillar currently develops the newest EU Stage V- compliant engines in industrial product line, ranging from the two-cylinder Caterpillar C0.5, to the 12-cylinder, 32-liter Caterpillar C32. Caterpillar's goals for Stage V engines include developing more efficient after-treatment systems, simplifying installation and increasing the productivity and fuel efficiency. Caterpillar forwarders, such as Cat 574 (1999-2003) and Cat 554, are forestry machines that carry felled logs from the glade to the landing on the road. Forwarders are usually divided by their loading capacities. Caterpillar forwarder’s range of rated load capacities goes from 13 to 20 tons. Cat 574 (1999-2003) has operating weight of 17,3 tons, net load of 14 tons and it is equipped with 8 tyres. The operating weight of Caterpillar 554 forwarder is 13,6 tons and its net load is 9,5 tons. Newer Caterpillar forwarders such as the 574 (new version), the 584 and the 584 HD are designed for maximum visibility and their cabs are spacious and comfortable. Caterpillar 584 HD forwarder offers the highest carrying capacity of 20 tons and it is powered, similarly to Cat 584, by Cat C7 Acert engine rated at 204 kW (274 HP) of gross power. The loader reach of Cat 584 HD is 8,5 m and its bunk area is 5,5 m². Caterpillar 584 forwarder offers load capacity of 18 tons, its operating weight is 20230 kg and it is capable of maximum travel speed of 22,5 km/h due to eight wheel drive. The new version of Cat 574 forwarder is equipped with Cat C6.6 Acert engine rated at 129 kW (173 hp) and its maximum travel speed is 13.0 km/h. The loader reach of Caterpillar 574 is 6,9 m, offers load capacity of 14,5 tons and its maximum travel speed is 13 km/h. A skidder is capable of a process called “skidding”, which is basically the transportation of cut logs from the forest or cutting site to a landing, where they are loaded onto trucks. Caterpillar skidders are four wheel drive tractors with diesel engine, robust protective structure, log grapple on the one side (sorting/bunching type) and dozer blade on the other side of the skidding tractor. Caterpillar 515 special skidding tractor is a 16,5 tons heavy forestry machine, introduced in 1996. Cat 515 is, similarly to Caterpillar 525, powered by Cat 3304 DIT diesel engine rated at 118 kW/159 hp (Cat 525: 134 kW/179 hp). The grapple capacity of Cat 515 is 0,74 m2, whereas Caterpillar 525 is capable of grappling 0,84 m2 - 1.16 m2 of material. In 2014, Caterpillar introduced newest series of special skidding tractors — The D series — including Cat 525D, Cat 535D, Cat 545D and Cat 555D. In 2001, Caterpillar launched three models of the B-Series articulated dump trucks: the 735B, the 740B and the 740B EJ. These machines became revolutionary due to reduced exhaust emissions and more efficient operations than the previous D-series articulated dump trucks such as Caterpillar D300D, CAT D25D or CAT D400D. Caterpillar 735B and the 740B articulated dump trucks also featured an improved cab design with controls for easier machine handling, maneuverability and productivity. Caterpillar 735B is a lighter model (29,8 tons) than Caterpillar 740B (32,6 tons) with 19,7 m³ of dump capacity against 22,9 m³, provided by Caterpillar 740B. CAT 735B articulated dump truck also offers lower payload of 32,7 tons, whereas CAT 740B offers 38,1 tons of net load. Caterpillar 740B EJ is a ejector dump truck with rated payload of 38 tons, EU Stage IIIB Cat C15 ACERTTM engine of 365 kW (489 HP) and heaped capacity of 23,1 m³. The D-series of Caterpillar articulated dump trucks, launched in 1989, includes older Caterpillar machines such as D25D, D250D, D300D and 3 more. The largest machine in this series is the D400D — 28-ton heavy machine with net load of 36,3 tons, dump capacity of 23,5 m³ and Caterpillar 3406 DITA engine rated at 287 kW (385 HP). 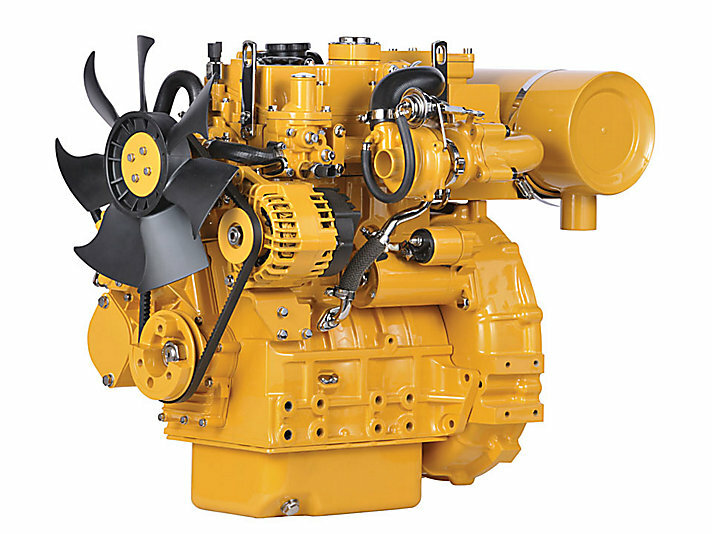 Caterpillar D350D and the D300D share the same engine — Caterpillar 3306 DITA, but they differ in power as CAT D350D offers 213 kW (286 HP) and CAT D300D offers 194 kW (260 HP). A bit larger articulated dump truck, CAT D350D also offers 20 m³ of dump capacity and 31 tons of payload. Smaller D300D is equipped with 18 m³ dumper and 27,3 tons of capacity. Caterpillar D250D is something like a happy medium: 17,3 tons of weight, 14 m³ of dump capacity, net load of 22,7 tons and Caterpillar 3116 DITA engine of 164 kW (220 HP). Caterpillar D25D and CAT D40D are more compact machines, that suits better for restricted areas. Caterpillar D25D articulated dump truck weighs 19,2 tons and offers 18 m³ of dump capacity and net load of 22,7 tons. 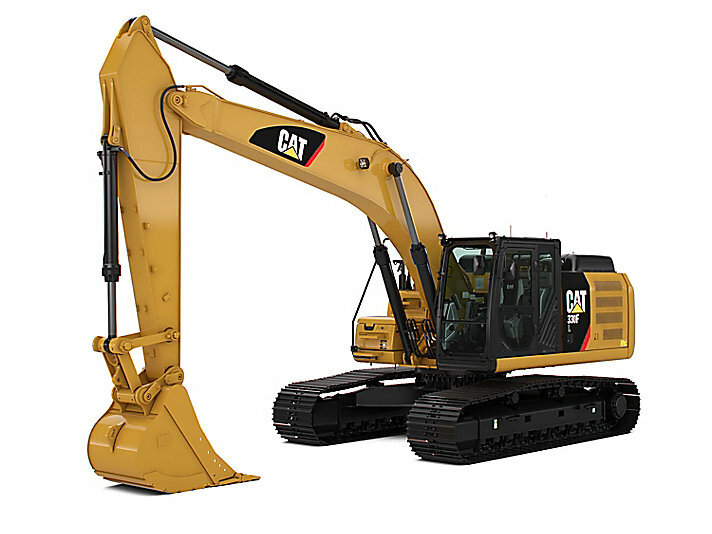 The machine is powered by CAT 3306 DITA of 213 kW (286 HP). Caterpillar D40D is 27,6 ton heavy model, equipped with CAT 3406 DITA rated at 287 kW (385 HP) and providing dump capacity of 28,9 m³ and net load of 36,3 tons. The newest F2 series of Caterpillar backhoe loaders comes with ergonomic operator’s cab and ECO mode, providing the power to save up to 15% of fuel. CAT 415F2 is the smallest machine in the series, weighing 6,9 tonnes. Caterpillar 415F2 backhoe loader offers bucket with 0.76 m³ of capacity, backhoe tear-out force of 59,1 kN and maximum travel speed of 36 km/h. Caterpillar 415F2 machine is driven by Caterpillar C3.4B engine (Tier 4 Final) of 55 kW/68 HP. Caterpillar 427F2 backhoe loader weighs 8,1 tonnes and is equipped with 1,03 m³ bucket and CAT C3.4B engine (Stage IIIB) of 55 kW/68 HP. It can travel up to 40 km/h and has backhoe tear-out force of 63,4 kN. Similarly to CAT 415F2 and CAT 427F2, also the 428F2 can be equipped with optional attachments, making it all-round machine. It provides 1,03 m³ of bucket capacity, travel speed of 40 km/h, backhoe tear-out force of 63,4 kN and CAT C3.4B engine rated at 55 kW/68 HP. Caterpillar 432F2 and 434F2 are bigger machines, weighing 8,4 tonnes and 9,2 tonnes, respectively. Both machines are equipped with load-sensing system, delivering the power exactly as needed, depending on the load and therefore increasing the fuel efficiency. Moreover, CAT 432F2 and CAT 434F2 and other F2 series models of backhoe loaders are equipped with new 6 speed autoshift transmission, that helps to save 6% of fuel and provides 2,5% increased average top speed (40 km/h) over the previous models. Both models are driven by CAT C4.4 Acert engine of 74,5 kW/101 HP and provide tear-out force of 63,4 kN. Caterpillar 434F2 has a bigger standard bucket capacity (1.15 m³) than CAT 432F2 (1.03 m³). The biggest and the most powerful machine in the series is the Caterpillar 444F2 backhoe loader. This model weighs over 9,6 tonnes and provides backhoe tear-out force of 63,4 kN and 40 km/h travel speed. Caterpillar 444F2 is almost 6 metres long and 4 metres high machine, driven by CAT C4.4 Acert of 74 kW/101HP. Caterpillar offers a range of small dozers, like the D3K2, the D4K2 and the D5K2, equipped with C4.4 ACERT™ diesel engine meeting U.S. EPA Tier 4 Final/EU Stage IV. Caterpillar D3K2 bulldozer is almost 8 tonnes heavy machine and offers intermediate blade capacity (SAE) of 1,5 m³. The engine is rated at 59,7 kW/80 HP and provides maximum travel speed of 9 km/h. Caterpillar D4K2 bulldozer offers the same blade capacity as CAT D3K2 — 1.5 m³ and travel speed of 9 km/h. However, its engine power is higher — 68,8 kW/92 HP. Caterpillar D5K2 dozer offers even more powerful engine than CAT D4K2 and CAT D3K2 — 77,6 kW/104 HP. The machine weighs over 9,2 tonnes and it is equipped with blade rating capacity of 2.09 m³. We can find CAT D6K2 with a power of 97 kW and these dozers: CAT D6N, CAT D7E, and the D6T dozer from the T-series in medium dozer range. Caterpillar T-series continues in the large bulldozer series with these machines: Caterpillar D8T equipped with Cat C15 ACERT™ engine and power of 264 kW, Caterpillar D9T driven by C18 ACERT™ engine with power of 325 kW, D11T equipped with Cat C32 with power of 634 kW, CAT D10T2 equipped with C27 ACERT™ engine with net power of 447 kW, and CAT D11T CD bulldozer driven by C32 ACERT™ engine with power of 364 kW. Caterpillar RM 300, launched in 2006, is a 24,45 tons heavy road reclaimer being 10 m long, 3 m wide and 3,5 m high. The turning radius of CAT RM 300 is 3,9 m, its cutting width is 2438 mm and cutting depth 508 mm. Road reclaimer RM 300 is powered by CAT C11 Acert engine rated at 260 kW (354 hp), meeting Euro IIIA emission level, with maximum speed of 9,7 km/h. In 2000, Caterpillar launched RM 350 B with these specs: 25,3 tons of weight, cutting depth of 471 mm, transport width 3 metres, length 9,6 metres, height 3,4 metres. The RM 350 B is equipped with Caterpillar 3406 CDITA (14,6 l) engine with power of 345 kW/463 hp. Caterpillar RM 500 road reclaimer was introduced in 2006. Its weight is 27,43 tons, turning radius 3,7 metres, travel speed 9,7 km/h and its cutting performance is 2438 mm of cutting width and 457 mm of cutting depth. CAT RM 500 is powered by Cat C15 Acert engine with 403 kW/548 hp of power, meeting EU Stage IIIA emission requirements. Caterpillar RM 500 B is a versatile machine that can be used in applications such as: surface mining, agriculture, bio-remediation, haul roads and aggregate sizing. CAT RM 500 B is equipped with Cat C15 Acert engine rated at 407 kW (546 hp) of gross power, meeting Tier 4 Final/EU Stage IV emission standards. The machine weighs 28,4 tons, its maximum travel speed is 10 km/h, cutting/mixing width is 2438 mm and cutting/mixing depth is 508 mm. Caterpillar RM 500 B provides all-wheel drive and four steering modes for better traction and maneuverability. 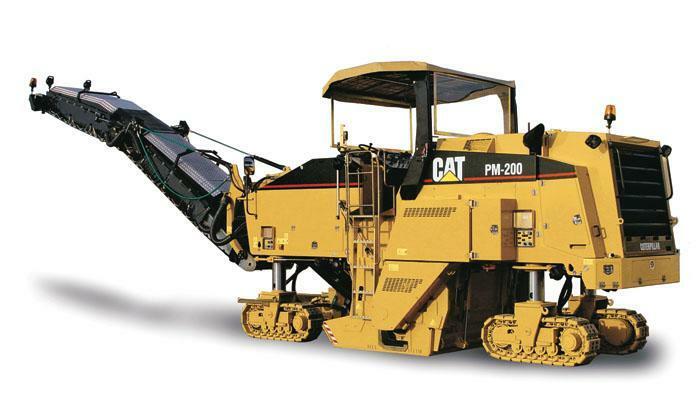 Caterpillar PM102 cold planer is manufactured in two versions: with wheel or track undercarriage. The wheel variant provides higher travel speeds, reducing machine repositioning times and enhancing machine maneuverability. Caterpillar PM102 cold planer is equipped with Cat Acert C7 engine with 168 kW/225 hp of gross power, meeting Tier 3/Stage IIIA standards. The operating weight is 17,6 tons and provided cutting dimensions are 1000 mm of width and 305 mm of depth. Caterpillar PM102’s upper conveyor is 600 mm wide. Another model — Caterpillar PM201 cold planer — has a shipping weight of 34,9 tons and offers maximum travel speed of 6 km/h and maximum operating speed of 40 m/min (with inside turn radius of 4,66 m). The cutting width of Caterpillar PM201 is 2100 mm maximum cutting depth is 305 mm. Operating length of the machine is over 15 metres, the width of the discharge conveyor is 915 mm and the width of collecting conveyor is 1020 mm. Caterpillar PM201 is powered by Cat C18 Acert with 485 kW/650 hp of gross power. CAT PM310, CAT PM312 and CAT PM313 cold planers are equipped with Cat C9.3 Acert engine delivering 242 kW/325 hp of gross power, meeting Tier 4 Final/EU Stage IV emission standards, with operating speed of 33 m/min. All three machines feature Automatic Load Control system for optimal cutting performance. CAT PM310, CAT PM312 and CAT PM313 cold planer models are offered both in wheel and track undercarriage modification. The operating weights of all 6 variants of models range from 21 to 22 tons. Maximum cutting depth is 330 mm for all, the milling width of Caterpillar PM310 cold planer is 1000 mm, the milling width of PM312 is 1225 mm and the milling width of Caterpillar PM313 is 1300 mm. The overall length of the machines with conveyor up is 11,11 metres. The range of Caterpillar PM-series continues with those models: CAT PM620 (weight of 29,4 tons, 330 mm of cutting depth, 2010 mm of cutting width, Cat C18 Acert with 470 kW/630 hp of power), CAT PM622 (weight of 30 tons, 330 mm of cutting depth, 2235 mm of cutting width, Cat C18 Acert with 470 kW/630 hp of power), CAT PM820 (weight of 32,23 tons, 330 mm of cutting depth, 2010 mm of cutting width, Cat C18 Acert with 563 kW/755 hp of power), CAT PM822 (weight of 32,8 tons, 330 mm of cutting depth, 2235 mm of cutting width, Cat C18 Acert with 563 kW/755 hp of power) up to the largest model — Caterpillar PM825 cold planer with operating weight of 37,5 tons, cutting depth of 330 mm, cutting width of 2505 mm and equipped with Cat C18 Acert rated at 563 kW/755 hp of power. This series covers the small Caterpillar excavators range — 6 machines in total, ranging from 11 to 18 tons. All of them are powered by fuel-efficient engines and improved hydraulic systems. They can be also equipped with additional attachments, making them even more suitable for various applications. The smallest model is CAT 311 F L RR crawler excavator, launched in 2017. Its weight is 12,5 tonnes, length 6,91 metres, width 2,5 metres and height 2,8 metres. Its dredging depth is 5,6 metres, maximum horizontal reach is 8,1 metres and it provides tear-out force of 89 kN. Caterpillar 311 F L RR is equipped with 500 mm wide tracks and bucket of 0,53 m³ capacity. Caterpillar 311 F L RR crawler excavator is driven by Caterpillar C3.4B (Stage IIIB) engine of 52 kW. Caterpillar’s largest crawler excavator is the 318F L — a 19,2 tons heavy crawler excavator powered by Cat C4.4 ACERT engine rated at 91 kW/122 HP. Its maximum horizontal reach is 8,46 metres and the dredging depth is 5,74 metres. Caterpillar 318F L is standardly equipped with 0,91 m³ bucket and is capable of tear-out force of 109 kN. The remaining crawler excavators are CAT 313F L (69 kW engine power, 15 tonnes weight), CAT 315F L (72 kW, 17 tonnes), CAT 316F L (88 kW, 17,7 tonnes), 313F GC (52 kW, 13,3 tonnes). 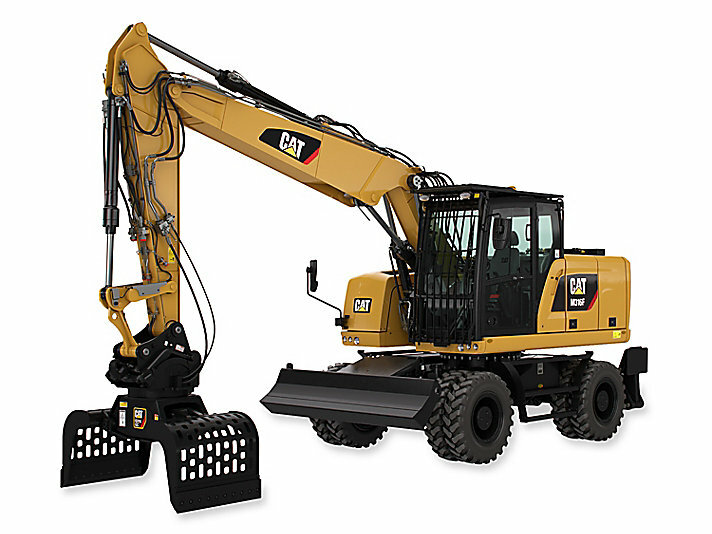 This series covers 10 medium-sized Caterpillar crawler excavators. CAT 320 is the smallest but compact crawler excavator, weighing 22,5 tons. It is equipped with C4.4 Acert engine (EU Stage IV/Tier 4 Final) of 121 kW/162 HP and bucket with capacity of 1.19 m³. CAT 320 crawler excavator offers tear-out force of 150 kN, max. horizontal reach of 9,86 metres and dredging depth of 6,72 metres. CAT 323 crawler excavator is equipped with 790 mm wide tracks and CAT C7.1 Acert engine of 121 kW/162 HP. Caterpillar 323 crawler excavator weighs 25,1 tons and provides tear-out force of 140 kN. The largest crawler excavator in range is CAT 335F L - 35,4 tons heavy model equipped with bucket of 1.4 m³ capacity, CAT C7.1 Acert of 151 kW (202,5 HP) and 600 mm wide tracks. When looking for better productivity, CAT 320 GC crawler excavator could be suitable. Its combination of large hydraulic pump and lower engine speed helps to save up to 20% of fuel compared to Caterpillar 320D2 GC crawler excavator. Caterpillar 320 GC also reduces maintenance costs by 15% compared to older CAT 320D2 GC. The performance can be expanded using optional attachments such as buckets, rakes, grapples, hydraulic hammers, multi-processors, quick couplers, rippers, pulverizers, shears, thumbs or vibratory plate compactors. This series covers 9 large Caterpillar crawler excavators, ranging from 36 to 90 tons. Due to their large size, powerful engines, speed, hydraulic systems and variety of attachments, these machines are suitable for large construction sites for earthmoving and heavy lifting operations. The biggest Caterpillar crawler excavator is the 390F L — standardly 88-ton-heavy model being 14,5 m long, 4,45 m wide and 5,84 high. Caterpillar 390F L is equipped with 650 mm wide tracks, bucket of 2.2 m³ capacity and powerful, Stage IV and Tier 4 Final relevant, CAT C18 Acert engine rated at 405 kW (543 HP). The maximum horizontal reach of Caterpillar 390F L crawler excavator is 15,73 metres and it provides tear-out force of 365 kN. Caterpillar 352F XE is one of the latest Caterpillar crawler excavators. It uses CAT-proven XE technology, featuring the ACS (the CAT Adaptive Control System) valve as the brain of the system, helping to reduce fuel consumption. Caterpillar 352F XE crawler excavator is capable of saving up to 10% of fuel compared to Caterpillar 352F, making it a market leader in the category of large crawler excavators. The 54-ton-heavy Caterpillar 352F is driven by CAT C13 ACERT engine with power of 317 kW (425 hp) and it is equipped with bucket of 2,1 m³ standard bucket capacity. CAT 340 is also efficient crawler excavator, saving up to 15% of fuel compared to the Cat 340F crawler excavator. Caterpillar 340 crawler excavator has a high-ambient capability of 52° C (125° F) and cold start capability of –18° C (0° F), making it suitable even for the toughest areas and climate zones. The inbuilt engine is CAT C9.3B with gross power of 234 kW (314 hp). The machine weighs 39,7 tons and features bucket capacity of 2,27 m³. In 1987, Caterpillar launched the B-series, including the 953 B and 963 B crawler loaders. The weight of CAT 953 B is 14,7 tons, its standard bucket capacity is 1,75 m³ and it is equipped with Cat 3116 engine offering 89 kW of power. Caterpillar 963 B is a 19,4 tons heavy crawler loader, equipped with bucket capacity of 2,3 m³ and Cat 3304 DIT engine with 118 kW of power. 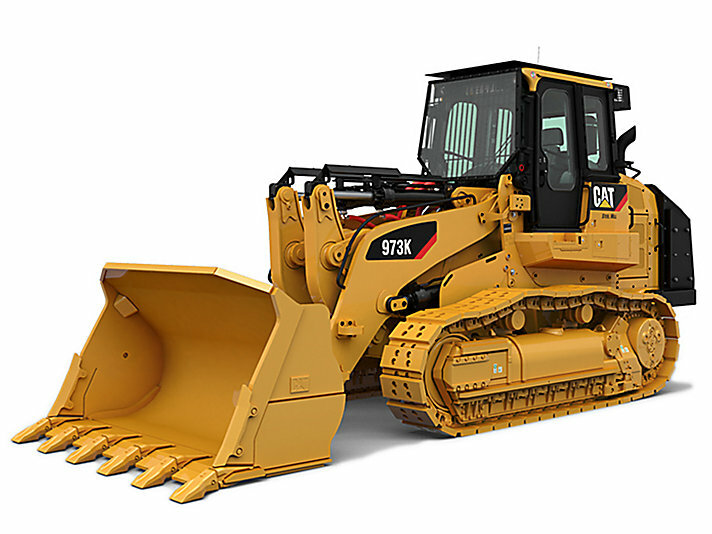 Since 1996, Caterpillar also offered CAT 963 B with Cat 3116 DIT engine rated at 119 kW. The C-series of Caterpillar crawler loaders is characterized with strengthened undercarriage for better durability and stability. Caterpillar 953 C was manufactured in two versions: the version manufactured between 1996-2004 equipped with Cat 3116 DIT engine of 90 kW with bucket capacity of 1,85 m³ and CAT 953 C manufactured between 2004 and 2006 equipped with Cat 3126 BHEUI engine of 95 kW with bucket capacity of 1,75 m³. Both versions were built on 500 mm wide tracks. The weight of Caterpillar 963 C is 19,6 t and it exerts ground pressure of 191,7 kg/cm². CAT 963 C crawler loader is powered by Cat 3116 DIT diesel engine rated at 119 kW/160 hp, its maximum speed is 10 km/h and its equipped with 2,45 m³ front bucket. Cat manufactured two versions of the 973 C crawler loader: the first one from 2000 to 2005 and the second one from 2006 to 2009. The older CAT 973 C offers power of 157 kW/210,5 hp and bucket capacity of 2,8 m³, whereas the newer CAT 973C is equipped with C9 Acert rated at 178 kW/238,7 hp. The D-series provides 10% more horsepower than the C-series, better fuel efficiency and reduced wear and provides lower exhaust emissions. CAT 953D, CAT 963D and CAT 973D also features load-sensing hydraulics, position sensing cylinders and tilting ergonomic cab. Caterpillar 973D track loader is the largest machine, weighing 28,1 tons, equipped with Cat C9 ACERT rated at 196 kW/263 hp. Its general purpose bucket provides capacity of 3,21 m³. Caterpillar 963D is equipped with general purpose bucket of 2.45 m³ or multi-purpose bucket of 1.9 m³ and Cat C6.6 ACERT engine with 141 kW/189 hp of power. Caterpillar 963D weighs 20,22 tons. Caterpillar 953D track loader is more compact compared to Caterpillar 973D and CAT 963D, weighing 15,5 tons and providing standard bucket capacity of 1,85 m³. Caterpillar 953D is equipped with Cat 6.6 Acert engine, offering 110 kW/148 hp of power and general purpose bucket with capacity of 1,85 m³. The K-series features the newest Caterpillar track loaders on the market suitable for land clearing, truck loading, digging, slope work or grading. Models of the K-series of Caterpillar crawler loaders consume between 10 and 25 percent of fuel compared to the D-series. Caterpillar 953K track loader travels on 480 mm wide standard tracks, the overall machine length is almost 6,4 metres, and the capacity of its general purpose bucket is 1,8 m³. The operating weight of CAT 953K is 15,6 tons and the machine is equipped with Cat C7.1 Acert engine offering 115 kW/154 hp of power, meeting EU Stage IV/Tier 4 Final emission standards and 1,8 m³ general purpose bucket (1.6 m³ multi-purpose bucket). Caterpillar 963K crawler loader consumes 10-25% less fuel than Caterpillar 963D. This is possible due to its Cat C 7.1 Acert engine rated at 144 kW/193 hp of power, being EU Stage IV/Tier 4 Final competent. CAT 963K has a steel track (550 mm wide) undercarriage, which allows the machine to work in various underfoot conditions such as wet and soft. The overall length of CAT 963K track loader is 7 metres, it is equipped with general purpose bucket of 2,5 m³ and weighs 20,3 tons. Caterpillar 973K crawler loader reduces fuel costs by 10-25% compared to Cat 973D. It is equipped with Cat C9.3 Acert diesel engine offering power of 205 kW/275 hp, meeting Tier 4 Final/Stage IV/Korea Tier 4 emission requirements. The overall length of CAT 973K crawler loader is 7,58 metres, its digging depth is 158 mm, standard track width 550 mm. The machine can be equipped with wide range of front buckets such as general purpose bucket (3,2 m³), performance series (3,8 m³), multi-purpose (3 m³), landfill (4,9 m³) or slag (3 m³). All three Caterpillar K-series models are offered in waste handler variant and therefore being equipped with landfill buckets: CAT 953K WH (2,3 m³), CAT 963K WH (3,1 m³) and CAT 973K WH (4,9 m³). Caterpillar skid steer loaders are very versatile because they can be used in construction, agriculture, landscaping, and road work. Since 2011, Cat offers the B Series 3 of skid steer loaders of which just 2 models are available nowadays — Caterpillar 216B Series 3 and CAT 226B Series 3. Both skid steer loaders feature radial lift design, providing mid-lift reach and suitable performance. Caterpillar 216B Series 3 skid steer loader uses Cat C2.2 engine with power of 35 kW (47 hp) and Caterpillar 226B Series 3 skid steer loader is equipped with Cat C2.2 CRDI engine with power of 49 kW (56 hp), with both engines meeting Tier 4 Interim/EU Stage IIIA emissions requirements. Caterpillar 216B Series 3 weighs 2,58 tons and offers rated capacity of 635 kg. Its bucket capacity is 0,635 m³ and the lifting force is 18,16 kN. It can travel maximally 12,7 km/h. Caterpillar 226B Series 3 is marked with high flow hydraulic system for even greater machine versatility and better performance as it can be equipped with various work tools such as brushcutters, hydraulic hammers, landscape rakes, blades, forks, trenchers, shears, etc. CAT 226B Series 3 weighs 2,64 tons and offers rated capacity of 680 kg. Its bucket capacity is 0,36 m³ and the lifting force is 18,16 kN. Caterpillar 236B Series 3 is a 3,18 tons heavy skid steer loader, offering bucket capacity of 0,4 m³ and lifting force of 24,39 kN. CAT 236B Series 3 is powered with Caterpillar C3.4 DIT engine rated at 53 kW/71 hp, that is Tier 4 Interim/EU Stage IIIA compliant. CAT 242B Series 3 weighs 3,18 tons and offers bucket capacity of 0,36 m³ and lifting force of 20,04 kN. This model is driven by Caterpillar C3.4 DIT with 53 kW/71 hp of power. Caterpillar 252B Series 3 is the heaviest skid steer loader from this series, weighing over 3,5 tons. It is equipped with bucket of 0,4 m³ capacity and lifting force of 24,5 kN. The driving power is provided by Caterpillar C3.4 DIT engine rated at 53 kW/71 hp, Tier 4 Interim/EU Stage IIIA relevant. The C-Series of Caterpillar skid steer loaders was introduced and released in 2007. This series differs from other CAT skid steer loader series mainly in the fact that the C-Series models have track drive instead of wheel drive. Caterpillar 277C is a 4,3 tons heavy skid steer loader, equipped with a bucket of 0,48 m³ capacity. This multi-terrain loader has a radial lift design, providing better digging performance. The 277C’s tipping load is 3028 kg and the two-speed optional powertrain can deliver a maximum speed of 14,9 km/h. The machine’s engine is CAT C3.4 DIT rated at 63 kW (84 hp). Caterpillar 279C compact track loader is equipped, similarly to 277C, with a sealed and pressurized cab providing quiet and comfortable operator’s environment. CAT 279C skid steer loader weighs almost 4,5 tons and is equipped with CAT C3.4T engine of 63 kW/84 hp gross power. The tipping load of Caterpillar 279C is 2941 kg and it can travel up to 13,6 km/h. 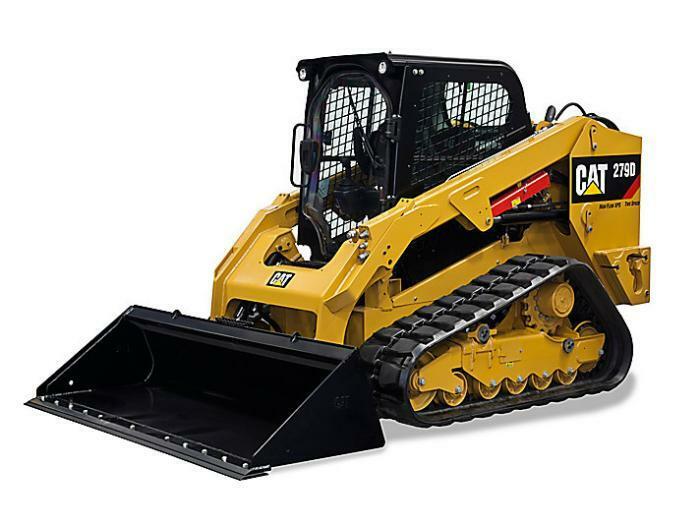 The largest skid steer loader of those three mentioned (CAT 277C, CAT 279C) is Caterpillar 289C. This model is one of the most versatile track loaders because it can be equipped with various work tools such as brooms, augers, landscape tillers, forks, carriages, trenchers and mulchers, enhancing the machine’s performance. Caterpillar 289C is powered by C3.4 T Stage IIIA compliant diesel engine rated at 63 kW/86 hp. Caterpillar 289C skid steer loader weighs over 4,7 tons and provides a tipping load of 3502 kg, a bucket capacity of 0,63 m³ and a breakout force of 33 kN. The latest product range of skid steer loaders is called the D-series, which consists of Caterpillar 226D and CAT 232D, driven by Cat C2.2 CRDI engine with net power of 49 kW (65,7 hp), Stage IIIB emissions standards relevant. This series of skid steer loaders continues with CAT 236D, CAT 242D, CAT 246D, and CAT 262D models, which are equipped with Cat C3.3B DIT turbo engine with net power of 54,4 kW (73 hp). CAT also offers the 272D2 (71 kW/95 hp) and the 272D2 XHP (79 kW/106 hp) skid steer loaders driven by Cat C3.8 DIT turbo engine. Caterpillar 226D is 2,6 tons heavy machine equipped with bucket of 0,36 m³ capacity, lifting force of 17,72 kN, tipping load of 1407 kg and rated operating capacity of 703 kg. In contrast with Caterpillar 226D, which provided mid-lift reach thanks to its radial lift design, Caterpillar 232D is based on vertical lift design. Thanks to this design, CAT 232D can load trucks even quicker and easier than CAT 226D. The machine also provides stability and lifting performance for optimal material handling. It is driven by Cat C2.2 CRDI engine rated at 50,1 kW (67,1 hp) of gross power. Its operating weight is over 2,8 tons and it offers rated operating capacity of 839 kg. Caterpillar 242D offers rated operating capacity of 975 kg, whereas CAT 236D offers 818 kg of capacity. CAT 262D skid steer loader weighs 3634 kg and offers rated operating capacity of 1225 kg. Caterpillar 272D2 and 272D2 XHP are Stage IV meeting skid steer loaders. XHP means high flow and high pressure hydraulic system delivering enough horsepower to run power-consuming work tools. Caterpillar 272D2’s rated operating capacity is 1542 kg, whereas CAT 272D2 XHP provides capacity of 1769 kg. This series is made of compact track loaders such as Caterpillar 239D and 249D skid steer loaders. Cat 239D features radial lift design with enhanced mid-lift reach and corresponding digging performance, whereas Cat 249D features vertical lift design providing extended reach for rapid and simple truck loading. Both models are equipped with suspended undercarriage, which guarantees optimal stability and traction. Cat 239D and 249D skid steer loaders are equipped with Cat C2.2 CRDI rated at 50,1 kW/67,1 hp of gross power. The operating weight of Cat 239D is 3306 kg, rated operating capacity 930 kg and maximum travel speed 11,2 km/h. Caterpillar 249D offers rated operating capacity of 1044 kg (50% tipping load) and the same travel speed as Cat 239D, however, Cat 249D weighs 3486 kg. The triplet of Cat 259D, Cat 279D and Cat 289D compact skid steer loaders is equipped with Cat C3.3B DIT (turbo) engine rated at 55,4 kW/74,3 hp of gross power and providing maximum travel speed of 11,3 km/h. Caterpillar 299D2 and Cat 299D2 XHP are two biggest models in this series of Caterpillar compact track loaders, weighing close to 5,20 tons. The XHP version is equipped with high output hydraulic system (70 kW), that is able to supply the most power-consuming attachments. Cat 299D2 weighs 5114 kg, while Cat 299D2 XHP is 5265 kg heavy skid steer loader. This series consist of Caterpillar multi-terrain loaders (part of D-series skid steer loaders), starting with Cat 257D — compact machine with extended lift and reach height featuring vertical lift design. The suspended undercarriage of Caterpillar 257D skid steer loader provides enhanced traction, making the wheel loader suitable for fast truck loading and rapid material transport around the worksite. Caterpillar 257D Multi Terrain Loader weighs 3,65 tons and provides rated payload at 50% tipping load — 1,27 tons. Cat 257D skid steer loader is equipped with Cat C3.3B DIT (turbo) engine rating 55,4 kW/74,3 hp and meeting Tier 4 Final (EU Stage II) emission standards. Caterpillar 277D multi terrain loader features radial lift design, whereas Caterpillar 287D possesses vertical lift design. 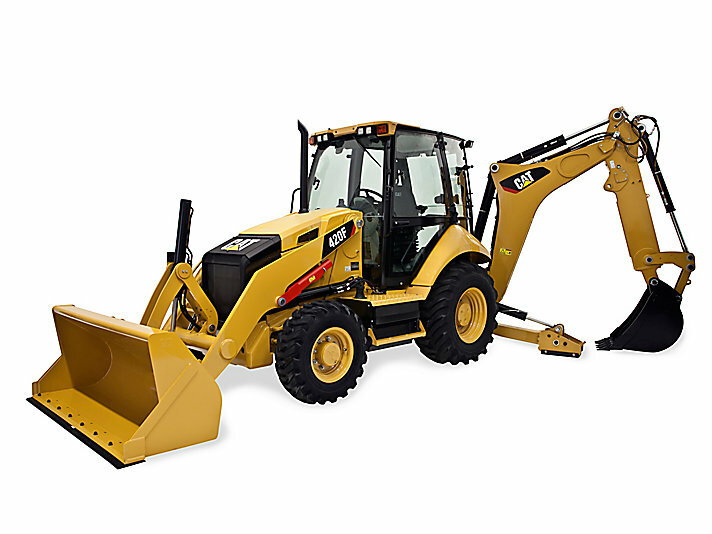 Both skid steer loaders are equipped with Cat C3.3B DIT (turbo) engine rated at 55,4 kW/74,3 hp. Cat 277D weighs 4215 kg and offers rated payload of 1492 kg, whereas Cat 287D weighs 4504 kg and provides rated payload of 1814 kg. Caterpillar 257D, the 277D and the 287D skid steer loaders offer wide range of attachments such augers, backhoes, buckets, brooms, forks, material handling arms, tillers, rakes, shears, compactors, wheel saws and trenchers, which support the versatility of Caterpillar multi-terrain loaders. Caterpillar 297D2 differs from Cat 297D2 XHP in its hydraulic system — the 297D2 uses high flow XPS hydraulic system rated at 57 kW of hydraulic power, whereas the 297D2 XHP uses XHP hydraulic system providing hydraulic power of 60 kW suitable to run the most power-consuming work tools. Both Caterpillar 297D2 XHP and 297D2 are powered by Cat C3.8 DIT (turbo) engine rated at 82 kW/110 hp gross power and 73 kW/98 hp of gross power, respectively. Caterpillar 297D2 XHP weighs 4952 kg and provides rated operating capacity of 2177 kg at 50% tipping load. Cat 297D2 skid steer loader, weighing 4850 kg, offers rated operating capacity of 2132 kg. The D series of Caterpillar special skidding tractors, introduced in 2014, features comfortable and ergonomic tilting cab, six speed transmission and other new improvements as they are designed for maximum productivity. The 4 models, Cat 525D, Cat 535D, Cat 545D and Cat 555D are powered by Cat C7.1 Acert engine and range from 151 kW (203 hp) to 205 kW (275 hp) of gross power and from 1,34 m2 to 2,04 m2 of grapple capacity. Caterpillar 525D is the smallest D-series machine, weighing 20525 kg and offering maximum travel speed of 20 km/h. The largest and strongest Caterpillar special skidding tractor is the 555D, weighing 21540 kg. Cat 555D, Cat 545D, and the rest of the D-series skidders, are designed to keep debris from collecting inside the machine, thus prolonging life of the machines and reducing maintenance costs. Caterpillar 814K wheel dozer, launched in 2018, is a successor of popular model Caterpillar 814, which has been offered as a market leader for almost 50 years. Caterpillar 814K is equipped with Cat C7.1 Acert rated at 185 kW/248 hp of net power, meeting Stage IV/Tier 4 Final emission standards. 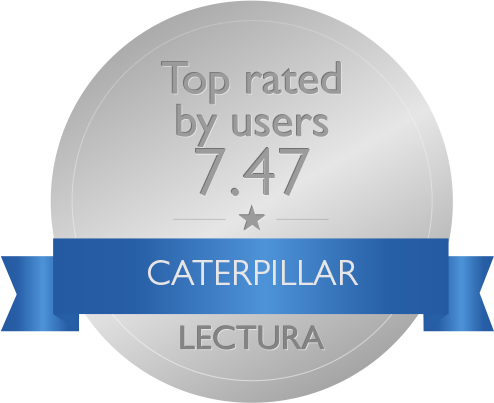 The operating weight of Caterpillar 814K is 21,95 tons and its blade capacity is 2,66 m³. Caterpillar 824K can be equipped with a range of Cat blades such as the straight blade with capacity 5 m³ suitable for earthmoving and stockpile dozing, the universal blade with capacity of 7,7 m³ for larger loads of material, the semi-universal blade (also 7,7 m³ capacity) combining the advantages of the two previous blades and the coal blade with capacity of 16,2 m³ with additional wings providing increased capacity for lighter materials. Caterpillar 824K is equipped with Cat C15 Acert offering rated power of 302 kW / 405 hp. Maximum blade capacity of Caterpillar 834K wheel dozer is 22,2 m³ (width of 5,074 m) and its weight 47,75 tons. Cat 834K is powered by Cat C18 Acert rated at 419 kW/562 hp of gross power and its travel speed is 38,5 km/h. Another large wheel dozer with robust structure is Caterpillar 844K. This machine is equipped with Caterpillar C27 Acert engine, providing gross power of 561 kW/752 hp, while meeting Tier 4 Final, Stage IV emission standards. Caterpillar 844K can be also equipped with a range of dozer blades with capacities ranging from 15,9 to 30,7 m³. Cat 844K wheel loader weighs close to 74,9 tons. The largest Caterpillar wheel loader is the 854K, suitable for largest mine and quarry applications. Cat 854K is powered by Cat C32 Acert engine rated at 676 kW/900 hp of gross power. The wheel loader can be equipped with blades ranging from 25 to 45 m³ and it weighs over 101 tons. The length of Cat 854K is 15,8 metres, its height 5,6 metres and the turning radius (over bucket) is 9550 mm. The B-series of Caterpillar wheel excavators, introduced in 1991, offers better performance compared to preceding CAT wheel excavator models without the “B” suffix (such as CAT 206, CAT 212 and CAT 214). The B-series features new single main pump, increased digging depth, reach and lift capacity, up to 75% faster travel speed, load sensing hydraulics and higher stick and bucket forces. Launched in 1991, the Caterpillar 206B wheel excavator was introduced as a replacement for Caterpillar 206 and manufactured in Germany. Caterpillar 206B is equipped with Cat 3114 DIT turbocharged engine rated at 78 kW (105 hp) of power and offers bucket capacity of 0,6 m³. Caterpillar 206B weighs 13,4 tons. According to Ritchie Bros. Auctioneers, over 1200 CAT 206B wheel excavators have been manufactured. Caterpillar 212B is 14,2 tons heavy wheel excavator, offering standard bucket capacity of 0,7 m³ and being powered by Cat 3114 DIT engine with a power of 83 kW (111,3 hp). Ritchie Bros. Auctioneers states that Caterpillar produced more than 1450 models of Caterpillar 212B wheel excavator. Caterpillar 214B, introduced in 1987, is a replacement for Cat 214 wheel excavator. Caterpillar 214B offers bucket capacity of 0,8 m³ and 82 kW (110 hp) of power produced by CAT 3116 DIT engine. Wheel excavator Caterpillar 224B is the largest model of those four, weighing 20,3 tons. It is equipped with Cat 3116 DIT engine providing power of 100 kW (135 hp). Cat 224B features extended wheelbase and redesigned control system for better operability. According to Ritchie Bros. Auctioneers data, Caterpillar has produced over 200 models of the 224B wheel excavator. The smallest machine in the C-series of Caterpillar wheel excavators — M 313 C Mono — weighs 13,6 tons and offers bucket capacity of 0,72 m³ (bucket width 0,9 m), horizontal reach of 9,82 metres, tear-out force of 62 kN, dredging depth of 5,45 m and outrigger stabilizers for better stability. Caterpillar M 313 C Mono wheel excavator is powered by Cat 3054 E-ATAAC 4.4 l engine with power of 86 kW (115 hp). Another two models of the C-series wheel excavators are Caterpillar M 315 C Mono and M 316 C Mono. Both machines weight around 16,7 tons. The M 315 C offers bucket capacity of 0,91 m³, whereas the M 316 C offers 0,99 m³ and also the engine power of M 316 C is higher than the power of M 315 C — Cat 3054 E-ATAAC 4l of 91 kW (122 hp) vs Cat 3056 E-ATAAC 6l of 103 kW (138 hp). The same goes for tear-out force (66 kN vs 79 kN), maximum horizontal reach (9,2 m vs 10,4 m) and dredging depth (5,89 m vs 6,07 m). The largest wheel excavator of the C-series is Caterpillar M 325 C L MH, weighing 36 tons. This excavator, suitable as a material handler, was introduced in 2004 and manufactured in Belgium. Its length is more than 12 metres and it is equipped with Cat 3126 B-ATAAC engine rating 140 kW (188 hp), providing maximum travel speed of 18 km/h. The stability of Cat M 325 C L MH is guaranteed due to the usage of 4 outrigger stabilizers. The D-series was introduced in 2007 and manufactured in France. It features better performance and more power compared to the C-series of Caterpillar wheel excavators. Caterpillar M313D Mono weighs 13,7 tons, similarly to its predecessor CAT M 313 C Mono. However, its bucket capacity is higher — 0,92 m³ and also the tear-out force of 73 kN. Cat M313D Mono is equipped with more powerful engine than CAT M 313 C Mono — Caterpillar C4.4 Acert rated at 98 kW (132 hp), meeting Tier 4 Final standards. Caterpillar M316D Mono offers bucket capacity of 1,12 m³, dredging depth of 5,37 m, tear-out force of 81 kN and Cat C6.6 Acert with 118 kW (158 hp) of power. The operating weight of Caterpillar M316D Mono is 18,1 tons. Caterpillar M318D Mono is a little bit larger wheel excavator, weighing 18,8 tons and being equipped with Caterpillar C6.6 Acert engine providing power of 124 kW/166 hp. The bucket capacity of M318D Mono is 1,03 m³ and its tear-out force 102 kN. The largest C-series wheel excavator is M325D L MH material handler weighing 36 tons and offering horizontal reach of 14,3 metres, dredging depth of 4,37 metres and Cat C7 Acert engine rated at 140 kW (188 hp). Caterpillar D2-series of wheel excavators follows the D-series and outperforms it, providing better performance and versatility. These machines are suitable both for truck loading and digging. There are currently 4 models offered by Caterpillar. The smallest one is CAT M315D2 — weighing 15,2 tons and measuring 8,3 metres (length). Caterpillar M315D2 is equipped with Cat C4.4 Acert engine rated at 101 kW/137 hp, meeting Tier 3/Stage IIIA emission standards. Cat M315D2 offers bucket capacity of 0,6 m³, tear-out force of 103 kN, turning outside radius of 6,2 m, maximum horizontal reach of 8,52 m and dredging depth of 5,3 m. Caterpillar M317D2 is larger model than M315D2, weighing 17,5 tons and being almost 8,5 metres long. Cat M317D2 offers bucket capacity of 0,83 m³, air-conditioned ROPS cabin, front blade, tear-out force of 114 kN, maximum horizontal reach 9,36 m and dredging depth of 6,09 m.
The second largest wheel excavator of the Caterpillar D2-series is the M320D2, weighing 20 tons and offering maximum horizontal reach of 9,45 m, bucket capacity of 0,91 m³ and dredging depth of 6,28 m. Cat M320D2 is 8,85 m long wheel excavator equipped with Cat C7.1 Acert engine, providing power of 123,5 kW/168 HP. The largest Caterpillar D2-series wheel excavator is the M322D2. This machine is 9,43 m long, weighs 22,5 tons, its maximum travel speed is 37 km/h and it offers horizontal reach of 10,32 m, tear-out force of 152 kN, turning radius of 6,8 m, standard bucket capacity of 1,19 m³ and dredging depth of 6,68 m. Caterpillar M322D2 is powered by Cat C7.1 Acert engine that provides power of 122 kW/164 hp and meets EU Stage IIIA/Tier 3 emission regulations. The versatility of Caterpillar M322D2 can be enhanced with additional attachments such as hammers, heavy-duty buckets or grapplers. In 2017, Caterpillar introduced and launched the F-series — a brand new series of versatile wheel excavators. All models, starting with Cat M314F and finishing with Cat M323F are equipped with modern engines that meet Stage IV emission standards. These engines are therefore fuel efficient and consume less CO2 emissions. Caterpillar F-series of wheel excavators such as M315F or M317F are equipped with outrigger stabilizers, heavy-duty axles and strengthened undercarriage for better stability and endurance. The largest wheeled excavator in the series — Caterpillar M322F is, similarly to other F-series models such as Cat M320F or M318F, equipped with new Cat Tilt-Rotator system for better versatility, that is even more enhanced in combination with quick coupler technology for rapid attachment changes. Cat M322F weighs 21,5 tons and offers bucket capacity of 1,19 m³, tear-out force of 152 kN, dredging depth of 6,05 m and horizontal reach of 9,91 m. Model Cat M322F is powered by Cat C7.1 Acert engine rated at 126 kW/169 hp of power. Operator’s environment provides redesigned controls and joysticks for smoothness and simplicity. The cabs of F-series wheel excavators also offer improved visibility and, moreover, safe and quiet environment. Caterpillar M318F and larger M320F wheel excavators are both equipped with Cat C7.1 Acert engines providing power of 126 kW/169 hp and maximum travel speed of 35 km/h. Cat M318F is 8,45 m long wheel excavator, which weighs 18 tons and offers horizontal reach of 8,73 m, tear-out force of 114 kN and dredging depth of 5,39 m.
Cat M320F weighs 19,5 tons and offers bucket capacity of 0,98 m³, dredging depth of 5,98 m, tear-out force of 137 kN and horizontal reach of 9,3 m. Caterpillar M320F is almost 8,92 m long wheel excavator. The smallest Caterpillar wheel excavator of the F-series is the M314F, equipped with Cat C4.4 Acert engine with 105 kW/141 hp of power, providing travel speed of 37 km/h. Cat M314F weighs 15,32 tons and offers dredging depth of 5,03 m, tear-out force of 103 kN and horizontal reach of 8,28 m. Cat M314F standard bucket capacity is 0,53 m³. Caterpillar also offers versatile M323F railroad wheel excavator, that can easily switch between rail and road applications such as earthmoving and material lifting. The railroad wheel excavator Caterpillar M323F weighs 24 tons and offers bucket capacity of 0,8 m³ together with tear-out force of 114 kN, horizontal reach of 9,09 m and turning radius of 6,3 m. Cat M323F is equipped with Cat C4.4 Acert engine providing power of 112 kW/150 hp. All models of the F-series of Caterpillar wheel excavators can be additionally equipped with wide range of buckets suitable for various applications such as digging, excavating, trenching, loading, finishing, grading or landscaping. Whatsoever, Cat offers attachments such as grapplers, digging grabs and the E-series hammers to even more expand the versatility of its wheel excavators. In 2015, Caterpillar introduced the MH 3037 — 39,5 tons heavy material handler/wheel excavator suitable for scrap recycling, industrial, millyard and waterway applications. Maximum horizontal reach of Caterpillar MH 3037 wheel excavator is 15,9 metres, its dredging depth is 4,9 m and length almost 12,6 m. Cat MH 3037 is powered by Cat C7.1 Acert engine rated at 168 kW/225 hp. In 2018, Caterpillar launched 3 new wheel material handler models — the MH3022, the MH3024 and the MH3026. This generation of wheel excavators comes with new cab features such as reduced sound levels, vibrations and improved visibility. The 2,4 m high cab can be further elevated to provide the operator with comfortable view, although it offers safe low ground entrance. Caterpillar MH3022, MH3024 and the MH3026 wheel excavators are equipped with Cat C7.1 Acert engine, meeting Tier 4 Final/EU Stage IV emission standards and providing power of 129,4 kW/174 hp. Maximum horizontal reach of Caterpillar MH3022 is 9,33 m and dredging depth 1,655 m. This model weighs almost 23 tons and offers reduced fuel consumption by up to 10% compared to previous D MH series, and therefore lower operating costs. Cat C7.1 Acert engine of the MH3022 wheel excavator can optionally run on biofuel. Caterpillar MH3024 weighs 24 tons and offers horizontal reach of 10,35 m and dredging depth of 1,485 m. The transport length of Caterpillar MH3024 is 9,715 m. The largest material wheel excavator is MH3026, weighing 25,22 tons and providing dredging depth of 1,82 m and horizontal reach of 11,44 m. The machine can be equipped with additional attachments such as grapplers (clamshell, digging, waste handling, orange peel type), improving the versatility of Caterpillar MH3026 wheel excavator. The M-Series of Caterpillar wheel loaders features compact size, small size and medium size models, ranging from 5,60 to 35,5 tons of operating weight and from 0,75 to 12 m³ of bucket capacity. Caterpillar 906M wheel loader is a compact machine, that can easily maneuver on the worksite. It is designed to be simple, cost effective and to suit multiple applications. Caterpillar 906M wheel loader is standardly equipped with bucket of 0,9 m³ capacity, 18" rim size and its tipping load is 3405 kg. CAT 907M and CAT 908M are other two compact-size machines, that are similarly to Caterpillar 906M equipped with Cat C3.3B DIT engine rated at 55 kW (74 hp), meeting EPA Tier 4 Final/EU Stage IIIB (V) emission standards. The tipping load of CAT 907M wheel loader is 3,50 tons, whereas the tipping load of CAT 908M is 3,77 tons. They also differ in possible bucket capacities, Caterpillar 907M offers 0.75 m³ - 1.2 m³ and CAT 908M offers 0.9 m³ - 1.5 m³. The buckets can be replaced with additional work tools like plows, grapplers and forks and the machines will become suitable for various agricultural applications. The compact-size range is completed with the Caterpillar 910M and Caterpillar 914M wheel loaders. These models are equipped with Cat C4.4 ACERT rated at 74 kW (100 hp), meeting the EPA Tier 4 Final/EU Stage IV emission standards. Both machines bucket capacities range between 1,3 and 1,9 m³. The operating weight of CAT 910M is 8,25 tons, whereas CAT 914M weighs 8,72 tons. This is a range of small-size wheel loaders of the Caterpillar M-Series. The smallest of these machines is Caterpillar 918M wheel loader, offering 86 kW (115 hp) of gross power, produced by Cat C4.4 ACERT engine, meeting EPA Tier 4 Final/EU Stage IV emissions. Caterpillar 918M also features ECO Mode for additional fuel savings. CAT 918M wheel loader weighs over 9,56 tons and it offers bucket capacities ranging from 1,3 to 1,9 m³. Caterpillar 926M is a 13-ton-heavy all-rounder, that can be used as an agricultural handler, aggregate handler or waste handler, depending on the configuration and front bucket usage. Its bucket capacities range from 1,9 to 5 m³ and therefore are suitable for various applications. CAT 930M offers the same configurations as CAT 926M, serving possibly as waste or agricultural handler or just as a standard wheel loader. Its bucket capacities range between 2,1 and 5,0 m³ and the loader weighs 14 tons. Caterpillar 930M’s engine is Cat C7.1 ACERT, providing power of 122 kW (164 hp), Tier 4 Final/EU Stage IV ready. Caterpillar 930M’s maximum forward speed is 40 km/h. The last and the largest wheel loader in the small-size category is CAT 938M — 16,4 tons of weight, bucket capacities of 2,5-5 m³ and Cat C7.1 ACERT engine of 140 kW (188 hp). Caterpillar 950M is a wheel loader manufactured with the emphasis on durability, reliability and versatility. Its performance is delivered by Cat C7.1 ACERT engine rated at 171 kW (230 hp). The machine weighs over 19,2 tons and it can be equipped with buckets ranging from 2,5 to 9,2 m³. CAT 950M’s breakout force is 181 kN and maximum travel speed 39,5 km/h. Another model, Caterpillar 962M is offered in two variations, which differ only in the type of engine. The first one is equipped with Cat C7.1 ACERT rated at 196 kW (263 hp) of gross power and being EPA Tier 3/EU Stage IIIA relevant. This version of CAT 962M delivers increased engine power by 8% in comparison with models of the Caterpillar H-Series wheel loaders and also, this version is up to 10% more fuel efficient than the Caterpillar K-Series of models and even up to 25% more efficient than the Caterpillar H-Series loaders. The second version of CAT 962M wheel loader is equipped with Cat C7.1 ACERT rated at 202 kW (271 hp) of gross power, meeting EPA Tier 4 Final/EU Stage IV emission standards. This engine’s power produces increased performance of 11% compared to CAT H-Series and the fuel efficiency is higher by up to 10% against CAT K-Series of models and by 25% against CAT H-Series loaders. Both versions of Caterpillar 962M wheel loaders weight 22,22 tons and they can be equipped with buckets ranging from 2,5 to 9,2 m³ of capacities. Caterpillar 966M and CAT 972M are manufactured in three versions, which also differ in the engine configuration. The core is Cat C9.3 ACERT, a 9.3 l engine, that is variously configured, meeting either Tier 4/Stage IIIB or Tier 4 Final/Stage IV emission standards. CAT 966M based models offer bucket capacity from 3,2 to 7,4 m³ and breakout force of 173 kN, weighing 23,22 tons, whereas CAT 972M based models offer bucket capacity from 3,2 to 9,94 m³ and breakout force of 196 kN, weighing almost 25 tons. Two of those configurations are called the 966M XE and 972M XE, launched in 2017, which are enhanced with the XE technology further improving the fuel efficiency by up to 25% compared to the CAT M-Series and up to 35% compared to the CAT K-Series of loaders. Both Caterpillar 966M XE and CAT 972M XE models are Stage IV ready. Caterpillar 980M is a larger wheel loader weighing 30 tons and offering breakout force of 224 kN, maximum travel speed of 39,5 km/h and Tier 4/Stage IV relevant, 12.5 l, Cat C13 ACERT engine with power of 317 kW (425 hp). CAT 980M’s bucket range grows from 4,2 to 12,2 m³ of capacity. The largest Caterpillar medium-size wheel loader is the 982M, weighing more than 35,5 tons and providing 4,6-12,0 m³ of bucket capacities and breakout force of 260 kN. CAT 982M wheel loader is powered by C13 ACERT rated at 325 kW (436 hp), meeting Stage IV standards. The K-Series of Caterpillar wheel loaders features largest and most productive Caterpillar wheel loaders. Caterpillar 986K wheel loader is equipped with Cat C15 Acert engine rated at 335 kW (449 hp), meeting Tier 4 Final/EU Stage IV emission regulations. Its bucket capacities range from 5 to 10,3 m³. Caterpillar also offers the 986K Block Handler, which is basically a standard Cat 986K wheel loader with optimized counterweight for better stability and durability, suitable for block handling applications. Modified CAT 986K Block Handler version weighs almost 53 tons, whereas the standard CAT 986K weighs over 44,8 tons. Caterpillar 988K is a model built on over 50 years of positive experience with popular Caterpillar 988 wheel loader. Caterpillar 988K features Eco Mode, saving up to 20% of fuel compared to CAT 988H. The machine is powered by Cat C18 ACERT engine, meeting Tier 4 Final/Stage IV emission regulations, rated at 432 kW (580 hp). Its standard bucket capacities are between 4,7 and 13 m³ and the rated payload of loose material is 14,5 tons. 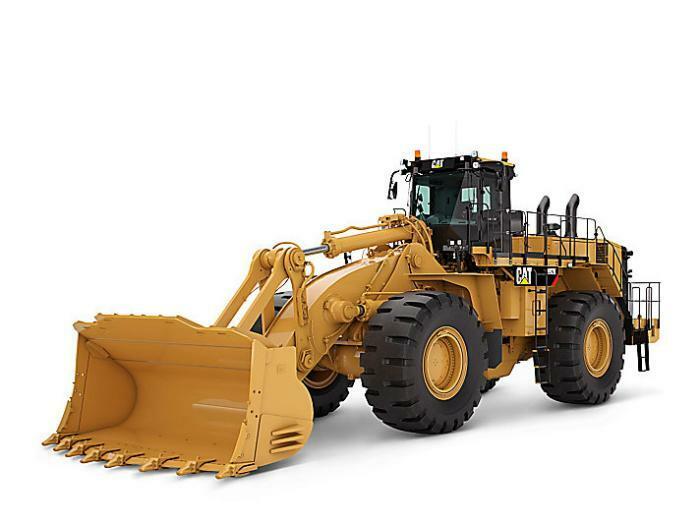 Cat 988K wheel loader weighs over 51 tons. There are 3 more versions of Caterpillar 988K wheel loader, that are equipped with additional counterweight and gadgets to suit the relevant applications: the 988K Millyard Arrangement, the 988K Steel Mill Arrangement and the 988K XE with advanced electronic drive technology improving overall efficiency by 25%. Even bigger wheel loader is the Caterpillar 990K, weighing almost 81 tons and offering a payload of 20 tons of loose material (15,9 tons of face material). Caterpillar 990K wheel loader can be equipped with buckets of capacities ranging from 7,4 to 14,9 m³ and Cat C27 Acert engine rated at 561 kW (752 hp). The large Caterpillar wheel loader series continues with CAT 992K — a model based on Cat 992 (introduced in 1968). Caterpillar 992K wheel loader weighs 99,8 tons and offers rated payload capacity of 21,7 tons, bucket capacity range of 10,7 - 12,3 m³ and maximum forward speed of 20,3 km/h. Wheel loader CAT 992K is equipped with 32,1 litre Cat C32 Acert engine providing gross power of 671 kW (900 hp), meeting Tier 4 Final requirements. In 2008, Caterpillar introduced the 993K wheel loader and as the company states, it became a success. Cat upgraded the older version and launched new version of the 993K wheel loader in 2012. Even though this model weighs 133,7 tons, operator’s comfort is guaranteed due to comfortable cab environment with reduced vibrations and noise level. 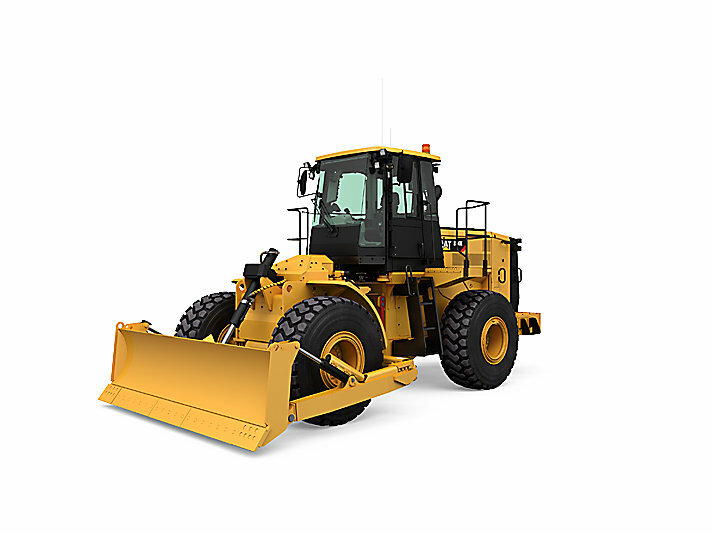 Caterpillar 993K wheel loader also features intelligent systems such as Payload Control System against overweight and VIMS™ 3G (Vital Information Management System), decreasing the service time. CAT 993K built in 2012 burns up to 10% less fuel than the 2008 version as it is equipped with Cat C32 Acert engine (Tier 2 ready) rated at 777 kW (1041 hp) of gross power with maximum speed of 22,5 km/h. The largest and most heavy Caterpillar wheel loader is the 994K. Based on the customer’s favourite CAT 994 model, introduced in 1990, the renovated model weighs 242,6 tons and offers bucket capacities ranging between 19,1 and 24,5 m³ and rated payload of 40,8 tons. Caterpillar 994K is equipped with EPA Tier 1/EU Stage I relevant Cat 3516E engine rated at 1377 kW (1847 hp) - it should be replaced very soon with EPA Tier 4 Final/EU Stage V emission standards engine. Caterpillar 994K wheel loader features similarly to Cat 993K intelligent systems such as Payload Control System or Vital Information Management System). The H-Series of Caterpillar wheel loaders builds on years of experience and therefore delivers basically revamped popular models. CAT 988H is based on the best sold wheel loader worldwide in this size class - Caterpillar 988, offering lower fuel consumption by up to 15%, advanced technologies and higher efficiency than his predecessor. CAT 988H is equipped with Cat C18 ACERT engine rated at 414 kW (555 hp) of gross power, that is EPA Tier 3 and EU Stage III compliant. Buckets are available in 6,4 m³ to 7,7 m³. A sure thing is a low-noise ergonomic cab and load-sense hydraulics for operator’s comfort. CAT 988H weighs 50,1 tons, its rated payload is 11,4 tons and maximum forward speed is 36 km/h. Caterpillar also offers two additional modified versions of the 988H: the 988H Millyard arrangement and 988H Steel Mill arrangement, which are 58,33 tons heavy models with improved counterweight for better durability and stability. CAT 986H wheel loader is a little bit smaller machine compared to CAT 988H, weighing over 43,7 tons. It can operate with buckets ranging from 5 to 10,3 m³ of capacity, its rated payload is 12,7 tons and maximum travel speed is 39 km/h. 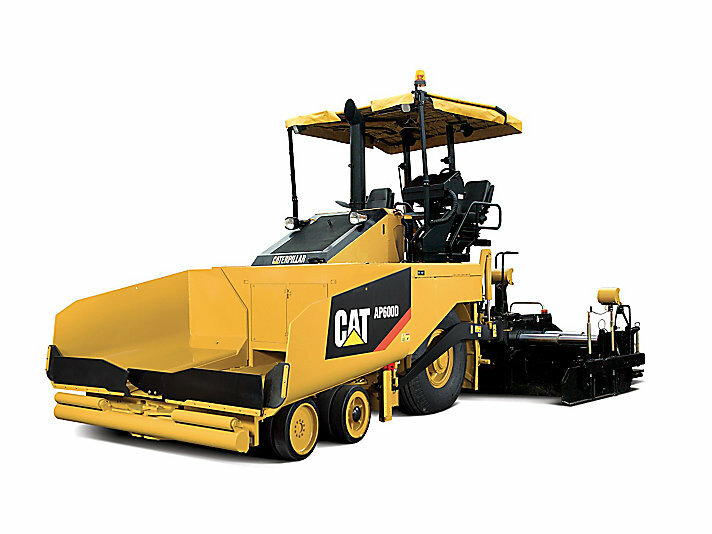 Caterpillar F-series of pavers comes with increased performance and versatility. The machines are equipped with powerful Tier 4 Final/Stage IV engines, while the fuel consumption stays reduced by efficient hydraulics and an eco-mode system. F-series wheeled pavers can run without problems even in the night time due to integrated generators, which provide power for lightning and other systems. Caterpillar AP300F is a smaller-size wheeled paver. Its paving range goes from 1,75 m to 4 m (width can be optionally reduced even to 700 mm), making it suitable for crowded or restricted urban areas or smaller job sites. Maximum operating weight of AP300F is 8,2 tons, maximum paving speed is 61 m/min and maximum travel speed 16 km/h. The core of the machine is Cat C3.3B engine providing power of 55 kW/73,8 hp. The maximum throughput capacity of Cat AP300F is 406 tons. Caterpillar AP500F is a mid-sized wheeled paver featuring integrated generator of 70 kW and the paving range of 2,55 - 5 m. The machine is powered by Cat C4.4 Acert engine providing 106 kW (144 hp) of power, paving speed of 76 mpm and travel speed of 16 km/h. Maximum operating weight of Caterpillar AP500F is 13,16 tons, maximum paving width 6,5 m and its hopper capacity is 6,7 m³. CAT AP600F is a mid-size wheeled paver suitable for highways, streets and rural roads. Its paving range is 2,55 - 5 m (max. paving width 8 m), maximum paving speed with vibratory screed is 76 m/min (14 km/h travel speed), hopper capacity 7,1 m³. Maximum operating weight of Caterpillar AP600F is 13,85 tons and it is equipped with Cat C4.4 with Acert, rating 129 kW/175 hp of power. The largest Caterpillar wheeled paver is AP1000F, suitable for large working areas such as airports and highways. This model has higher resale value due to long-life components and latest emission technology. CAT AP1000F is powered by Cat C7.1 Acert engine rated at 168 kW/225 hp of power and provides max. travel speed of 20 km/h and max. paving speed of 76 mpm. Its paving range is 3 - 5,95 m with maximum extension to 7,65 m of paving width. Standard capacity of the entry hopper of CAT AP1000F wheeled paver is 7,6 m³ and it weighs 15,8 tons (up to 20,6 tons with screed).